We've been wanting to offer notebooks for quite some time now, but we couldn't find a brand with good quality, fountain pen friendly paper that was reasonably priced. On a recent trip to Oregon, we discovered a brand named PENTALIC that meets our requirements. We hope they meet yours! Here are a few writing samples, showing how the paper performs with both vintage flex and modern wide-and-wet stubs. In our opinion, just the right balance between no-bleeding and a level of absorbency that works well with all the nibs we've tried. 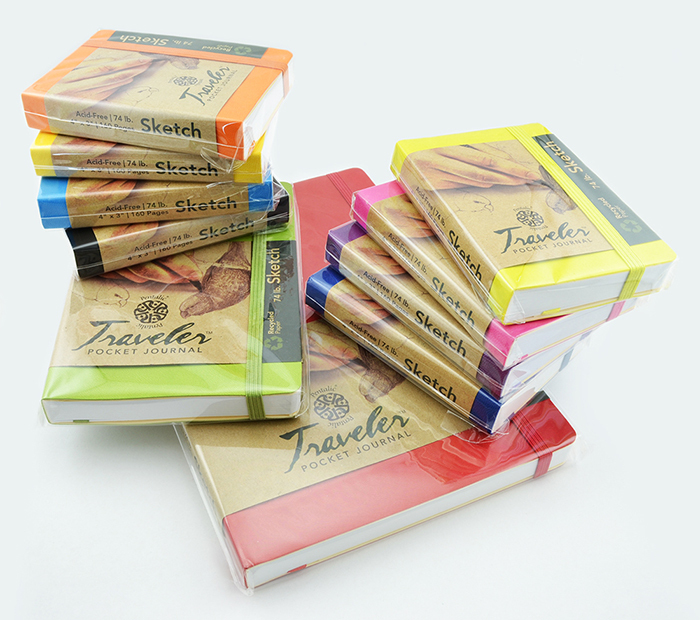 Their Traveler Pocket Journals are available in three sizes, feature heavy 74 lb (120 GSM) paper, and secures with an elastic strap. They come in ruled and grid paper in addition to their plain "sketch" notebooks. Discounted, introductory pricing will end July 31st, so don't delay. Visit our NOTEBOOKS and PAPER category. First of all, I'm writing about this nib because it literally caused my jaw to drop when I came across it while sorting thru our latest batch of new old stock 1960s Eversharp Symphonys. Secondly, try to ignore the surroundings in the photo below. New old stock pens are not always pretty, and some are too far gone to be one of our "seconds" offerings. Sometimes you can only salvage the nib, but in this case ooh-la-la, it was quite a nib. The name -- Flexible 1/2 Stub -- says it all, but before you get excited and say "where can I get one of these?! ", please note that we only found two of these nibs in literally hundreds of Symphony pens. This one was found on a Symphony 915, making the nib the middle size Symphony nib, the same as was found on the more common 701. The pen was totally trashed from many rough years in storage, with abjectly corroded trim and a rusted away lever/pressure bar assembly. We pulled the nib and threw it and its accompanying feed and breather tube into one of our mid-size 4CS Ranga eyedroppers, and it's been a real joy to write with for a week. The nib has really nice flex, which when combined with the italic cut delivers easy line variation when unflexed, and a nice pay-off on the downstroke when flexed. (You wouldn't want to flex on the horizontal stroke as you would pull the tines out of alignment, just an FYI.) This is the kind of nib for which people look to vintage Pelikans, though the nib thickness is a little thinner on the Eversharps. If I put together another one of these and can make it available for sale, I'll post an update. Though I call this posting "Nib of the Month," I'm not sure how often I'll find unusual and interesting nibs to feature. Sometimes it seems like there's a good candidate every week, but I don't want to commit to that as it seems overly ambitious and dependent upon more than a little bit of luck. 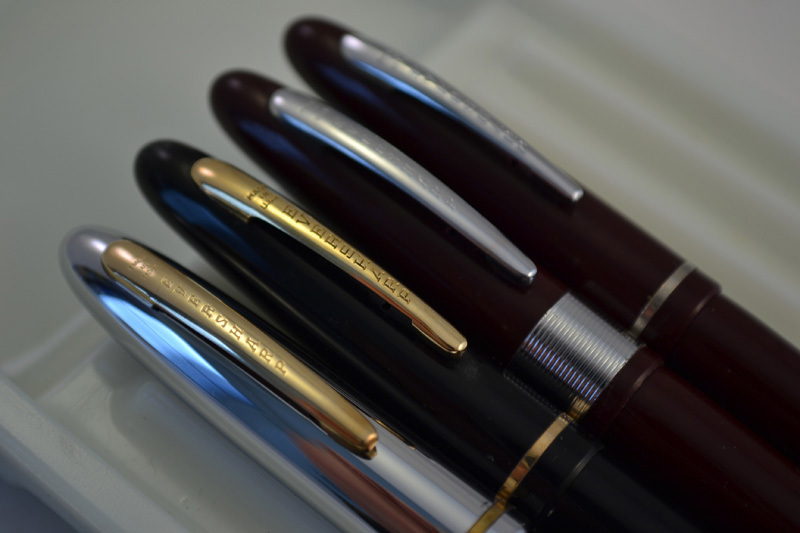 We just rolled out our latest project .... a photo listing of Sheaffer models. These are pens we've handled over the past year or two. It takes five web pages to fit them all in. We're calling it the Sheaffer Identifier. And since our regular photo set does not include posted pens, and we wanted to use horizontal shots exclusively, you will notice the lack of nib photos (though we will try to add nib info to the caption). We hope the Sheaffer admirers out there will find it useful. The Eversharp Symphony was launched in 1948 and couldn't have had a more auspicious beginning. While the company's previous major model, the Fifth Avenue, had some shortcomings that prevented it from catching on with the public, the company hoped to reproduce some of the success enjoyed by the iconic Skyline model which had achieved sales superiority in the mid 1940s. The Skyline had been designed by famous industrial designer Henry Dreyfuss, and for the Symphony the company went to another famous consumer-goods designer, Raymond Loewy. The first generation Symphony pens (aka model 500) can be partially distinguished by the raised fins on the chrome cap, the brushed stainless steel cap finish with no cap band, and the metal barrel threads. The raised fins create the impression of the cap being sliced lengthwise, and then offset slightly, giving the cap its "slipper" name. The first generation pens were only produced for a year. The second generation simplified some of the Loewy design. Model 701 came out in 1949 and can be identified by the thin gold plated cap band embedded in a shiny stainless steel cap. Additionally, a few new models were added to the product line. The 703 (the "Deluxe" Symphony, photo below) featured a wide gold plated cap band, and the "Golden Symphony" (model 705) had a gold filled cap. A "Luxury" version was created for the bottom level of the product line; hardly luxurious, it featured cheap gold plating and a rounded cap entirely lacking fins. Then came the third version circa 1951. Taking a cue from the "Luxury" pens, the caps lacked the finned design entirely. Documentation indicates a new model was introduced, the "Economy Gold Nib" set, and it is believed to be an all-plastic model. Right around this time Eversharp stopped using the Symphony name, and the pens are frequently found in ads under the name "The NEW Eversharp." In our new old stock acquisitions we have found several models which share the Symphony shape, nib and filling system, but lack the metal cap which many consider to be a characteristic of the Symphony line. Model 713 -- plastic body and cap, thin gold plated cap band, gold plated clip. Small flexible nib. Model 913 -- plastic body and cap, thin chrome plated cap band, chrome plated clip. Small flexible nib. Model ??? -- same as the 713 only lacking a metal cap band, having instead a series of grooves in the plastic where you'd find the cap band. Small flexible nib. Model 915 -- same as 913 except with a wider (3/16") lined chrome band. Medium sized nib, the same one as is found on the 701, in both flexible and manifold. Model 917 -- same as the 913 and 915, only with a very wide chrome cap band. This model featured a larger banner-style Eversharp nib, in both manifold and flexible versions. By 1952, the Symphony and quasi-Symphony pens disappeared from Eversharp's product line as they gave their attention to the Ventura model. We have a feeling that a large quantity of the low end Symphony pens were more or less abandoned out in the distribution channel, especially outside the US, and those are probably the models that we have discovered. Another theory holds that when Parker gobbled up Eversharp in 1957, they continued to produce low end pens under the Eversharp name to use up the surplus of parts, and these may very well be some of those pens. We're hoping that this post will bring more information to light. Surely there must be folks who worked at Eversharp in the 1950s and 1960s, and who will be able to poke holes in our theories and tell us more about these late-late-late model Eversharps.